Update your contact information at anytime. Check on your payment balance. Check on your scheduled pick up location. Most importantly, you will not have to fill out your contact information with a new CSA form every year or every different season; just enter information as a “Renewing Member” once you have entered your information initially in the system for the first time. Online credit card payments–If you are splitting a share, please make only one credit card payment, so decide which of you will do that. Mail in check payments– If you would like to use a check, you will receive an invoice response in your email after registering. Then you can send a check (or checks, if you are splitting a share) written out to “Tantre Farm” to our mailing address for the balance due listed on the invoice. IF YOU ARE SPLITTING A SHARE, PLEASE INCLUDE BOTH CHECKS IN THE SAME ENVELOPE. More information can be found about our CSA programs below. Please let us know if you have any questions after reviewing it. Thanks so much for your interest. HOW DOES THE SUMMER CSA WORK? Members will receive weekly distributions of fresh, organic produce for 18 weeks from the last week of May through the middle of October for $630. The quantity and variety will vary with the time of year and the weather. ***Sign up for “SUMMER CSA 2019” season here! You will receive your produce for your Summer CSA and your Extended Fall CSA each week in a 1/2 bushel box that will have been stored in a cooler as soon as it is packed in the mornings on Harvest Days (Tuesdays and Fridays). There will be about 8-10 items in your share during the first 4 weeks. You´ll continue to receive more items as the season continues, ranging from 8 to 16 items. A good estimate is to think of the amount you would be receiving as about 1 grocery bag of produce in June and as the season progresses in July and August about 2 grocery bags. Then in September and October you may receive about 2 or 3 grocery bags worth of produce depending on the bounty of the harvest. Each week our goal is to provide 1 to 4 salad greens (lettuce, arugula, etc. ), 1 to 4 cooking greens (collards, Swiss chard, spinach, etc. ), 1 to 4 root vegetables (carrots, potatoes, etc. ), 1 to 4 fruiting vegetables (tomatoes, corn, squash, etc. ), 1 or 2 alliums (onions, garlic, etc. ), 1 to 3 brassicas (broccoli/cabbage family), and 1 or 2 herbs. We grow a wide variety of crops, so you´ll be able to try new things and find out what it means to eat seasonally (i.e. asparagus is a spring/early summer crop, so it will not be available past June). Community Supported Agriculture, or CSA, is a way for small farmers to directly market their produce to the community. The community, in turn, directly supports its local farmers by purchasing an annual share of the farm´s products. When you join Tantré Farm CSA, you are joining a farm community. There is a community among all the members, the farmers, and the local ecology. No labor is required of members, but you are encouraged to come out and visit the farm to help nurture your ties with the land. Membership in a CSA is about sharing the risks, rewards, and responsibilities of growing delicious, sustainably-grown produce. In terms of risks, we never know what Mother Nature will do. We plant over 80 varieties of vegetables, fruits, and herbs, so that we can have a back up if a crop doesn´t produce as well as you or we would have liked. We also plant some crops successively (carrots, beans, corn, lettuce, greens, etc.) when possible, so that throughout the growing season, even if a crop fails due to some natural disaster, you may receive that crop a few weeks later or later in the season, although sometimes you just may not receive it at all. We also cultivate plant diversity and practice companion plantings, crop rotation, mulching, etc. We use row covers and encourage beneficial insects and pollinators, such as yellow-antennaed wasps, which feed on cabbage lupers. The rewards of your membership may be in the taste, nutrition, and freshness of your weekly box of produce available for 20 weeks in the summer months. Not only does a membership teach one to eat seasonally, it also might challenge someone to try eating a new vegetable, find a new way to cook an “old favorite”, or learn to like a “least favorite” by trying a new way of preparing it. Somewhat less obviously, we are rewarded intrinsically by participating in a movement of supporting small family farms, eating locally and seasonally, and developing a relationship with the farmer, the land, and the local community that supports it. 1. You agree to make a financial contribution to the farm in the spring or the previous fall/winter for that season’s share of vegetables. Final payments are due by May 1 for the Summer CSA, unless an alternative payment plan has been prearranged. 2.You agree to pick up your share each week at the location, day, and times specified, unless prior arrangements have been made for each individual CSA. 3.You agree to return your clean box from the previous week. We have a limited number of boxes, and we like to reuse them, so it is important that we get them back each week. and Extended Fall CSA each week in a 1/2 bushel bushel box that will have been stored in a cooler as soon as it is packed in the mornings on Packing Days (Tuesdays and Fridays). As the season progresses there will also be some “Share Add-Ons”. These items will be on the side, because they don’t fit in the box, were harvested after the box was put together, or don’t need refrigeration. You will be measuring or loading these items into bags yourself, so you can choose to take the maximum or less, if your family can’t use so much. Also, we don’t intentionally put worms or insects in your produce. Sometimes though these evasive creatures may slip by our volunteer´s or intern´s discriminating eye. Please don´t throw the produce away! There are many good parts to an ear of corn, even if you have to break off the tip to remove a corn earworm. You may need to soak something like broccoli in salt water to encourage the caterpillars to float to the top, and remove them. Cut off offensive parts, if needed, and keep in mind this produce is still edible, tasty, and nutritious even if it is not aesthetically appealing. You will pick up your Summer CSA share once a week for 18 weeks on your chosen pick up day only during the hours that are listed below. Basically there are two Distribution Harvests during the week. For the first distribution we harvest produce on Mondays and Tuesdays for the Wednesday Distribution. Then we harvest for the second distribution on Thursdays and Fridays for the Friday/Saturday Distribution. Our Packing Days (when we pack up your share box) are on Tuesdays and Fridays. Tantre Farm is located southwest of the city of Chelsea about 25 minutes from Ann Arbor and 25 minutes from Jackson. Please park on the North side of Hayes Road or in the driveway for those who are physically challenged. Go behind Main House to the “Distribution Shed” in the backyard. Please remember to check off contact person´s name and take a newsletter from the check-in table. Follow the instructions on the white boards inside. Get share box from walk-in cooler and choose the rest of the listed “share add-ons” that are bulk items inside and outside of Distribution Shed. Also, please feel free to ask a farm worker (in the herb garden or U-pick Flower Garden) or knock on house door, if you have any questions. Advantages for pick up at the farm are walking paths around the fields, visiting the animals, playing, exploring, and picnicking, flower bouquets, u-pick opportunities, extra produce in Grab Box, free-range eggs, and sometimes honey or other extra items for sale. 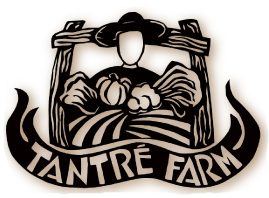 DISTRIBUTION for Farm: Wed. 10 a.m.-7 p.m., Fri. 2 p.m.-7 p.m.
Look for the Tantré Farm sign. Introduce yourself to us at the market stall, and you will be helped. Please remember to check off your name on the Pick up List, and take a newsletter from the clipboard, if needed. Advantages for pick up at Chelsea Farmers Market: You can buy extra items from our stall and other vendors’ stalls along with enjoying local live musicians, food demos, vendor basket giveaways, and other market events. We will try to be in the same location every week, but are not always able. There is a map on the outside wall of the market office, where our stall is listed. Please always look for the large, canvas Tantré Farm sign as you walk around the market. Then follow instructions on the white board, and especially remember to check off contact person’s name and take a newsletter, if you need it. It can get very crowded at the market, so for those of you who split shares, it might work better if you split your share at one of your houses, instead of at the stall where a lot of people are coming and going. Advantages for pick up at the market are that you can buy extra items from our stall and other vendors’ stalls and enjoy exploring the variety of Kerrytown stores and restaurants in downtown Ann Arbor. DISTRIBUTION at Ann Arbor Market: Wed. 7 a.m. until Noon. You can look for a sign that reads “TANTRE FARM” and follow instructions on the white board or ask for help, since there will usually be someone available at the Community High distribution site to help you. Please check off the contact person’s name, and take a newsletter if you need it. You can still find us at our Tantre Farm market stall at the Ann Arbor Farmers’ Market, especially if you need to purchase extra produce or have specific questions. Advantages for pick up at Community High are that you are right across the street from the farmers market and can buy extra items from our stall and other vendors’ stalls and enjoy exploring the variety of Kerrytown stores and restaurants in downtown Ann Arbor. This location is about 8 minutes directly north of downtown Ann Arbor. Our CSA distribution is in the entrance of the first building you will see with a round, “sun” window. It will take place again on the timber frame porch this summer. If anything is different, we will let you know. We will have tables set up, and there will usually be someone there to help you, if you have any questions. Sometime in the future we will have our Farm Market stocked with local produce and prepared food products, but we will let you know when that is ready. Our Agricultural Educational Event Space will also be ready for events that are “farm/food/fiber-related” sometime soon. Advantages for pick up at the Hub are indoor location, u-pick opportunities, plenty of free parking, picnicking areas, and sometimes free-range eggs, honey or extra food artisan/farm market items for sale. DISTRIBUTION for Hub: Wed. 6 -8 p.m. and Sat. 9 a.m. – Noon. Shares will be outside the building near the front door on the north side of of MOVE (www.movewellness.com). This will be a “self-serve” pickup spot, so please check off your name on the clipboard, follow the instructions on the Pick Up List, and take a newsletter if needed. MOVE staff can answer limited questions. There is no refrigeration, so please pick shares up promptly to enjoy your produce at its freshest! MOVE is not responsible for shares left unclaimed, so shares left there after noon will be donated or brought back to the farm, unless prior arrangements have been made. Advantages for pick up at MOVE: You have opportunities for classes at MOVE with pilates, yoga, massage, wellness coaching, etc. Other stores are nearby to shop or have a cup of coffee. Argus Farm Stop (www.argusfarmstop.com) is a year-round, every day farmers market featuring over 100 local producers in all categories including produce, meat, eggs, dairy. Every purchase you make supports local farms and producers! They also have a cafe for delicious coffee and baked goods. Shares will be inside building in the back room. Simply ask a friendly Argus staff and they will show you where your box is. Then check your name on the clipboard, and take a newsletter if needed. Argus staff can answer limited questions. There is no refrigeration, so please pick shares up promptly to enjoy your produce at its freshest! Argus is not responsible for shares left unclaimed, so shares left there after 6 PM may be donated or brought back to the farm, unless prior arrangements have been made. Advantages for pick up at ARGUS: You have opportunities to additionally purchase a wide array of local products to complete your local shopping experience. As well, there’s a great cafe and seasonal pop-up brunches are offered sometimes during drop off times. DISTRIBUTION at Argus-Packard: Sat. 10 a.m. – 6 p.m. Pure Pastures (www.purepasturesmi.com) is a specialty grocery store offering grass-fed meat, eggs, dairy products, and organic, gluten-free, nonGMO products. Shares will be outside on the north side of the building. This will be a “self-serve” pickup spot, so please check off your name on the clipboard, follow the instructions on the white board, and take a paper newsletter if needed. Pure Pastures staff can answer limited questions. Shares will not be refrigerated, so please pick up shares promptly (especially on hot days!) to enjoy your produce at its freshest. Pure Pastures is not responsible for shares left unclaimed, unless prior arrangements have been made. Advantages for pick up here are opportunities for extra purchases from “a healthy alternative to the big chain supermarkets”. DISTRIBUTION at Pure Pastures: Wed. 10 a.m. – 7 p.m.
1.SOMEONE ELSE PICKS UP: If someone else is picking up your share, you don´t need to let us know, just tell them to check the contact person´s name off the list. It would be very helpful though to give them our phone number or e-mail, so that they may contact us if they are not picking up for some reason. 2.PICK UP RESCHEDULE: Reschedule for a different Distribution Day within the same week. Please reschedule only on regular Distribution Days. Please give us a week´s advance notice. This can be done yourself on the Membership Actions Box on the Registration page or you can email us your desired changes. 3. VACATION HOLD: Tell us not to harvest your share, but please give us a week´s advance notice. At the latest, we really need to know by Sunday at the beginning of each week to get an accurate harvest count for the week. This can be done yourself on the Membership Actions Box on the Registration page or you can email us your desired changes. The shares need to be picked up by the designated times, especially at the Ann Arbor distribution sites, since we try to leave by noon so we can still use the rest of the daylight hours for farm work. If at the last minute you can´t pick up (or you forget) on your scheduled day, please call or email us sometime during that day, so that we know what happened. You may try to reschedule for pick up at the Farm later that day or the next day. Please DO NOT expect to pick up your box after the second day, since the share will have been taken apart by then or donated. We have a weekly newsletter that is automatically sent online on Tuesdays for those who have given us e-mail addresses. This is a text-only version, but a 2-page formatted copy can be picked up at each distribution site for those without e-mail or others who would prefer the printed copy every week. These newsletters also will be available on our website (see below). Included in each newsletter are a list of share items with descriptions, cooking or storage tips, important dates, preserving information, helpful hints, recipes, and feature articles about the farm and its workers, interesting facts about produce, and topics related to CSA and the organic food movement. The newsletter is designed, written, and edited by Deb, Richard, and farm interns. Contributions from members are also welcome, if we have space. Contact Deb. If you like the paper version, we suggest that you keep all of your newsletters in a binder or folder, so you can refer back to recipes, nutritional information, and cooking or storage tips throughout the season, but you can always refer to them on our website. We also try to keep the formatted newsletter to a 2-page minimum, which means that we don´t list all the share items´ descriptions every week, but refer you to previous newsletters for information on items that have already appeared in your shares. We are continuously updating our website. If you want to check it out go to: www.tantrefarm.com. It is a work in progress, so please be patient with us, since it may go through several changes as we continue to design, enhance, and improve it. We are open to your comments and suggestions of ways to make it more helpful and resourceful. We also try to keep up on our Instagram, Twitter, or Facebook sites, but these are maintained by the whims and interests of our techy-savy new interns, so they are updated off and on throughout the season. *Please “like” our Tantre Farm Facebook page as well for farmers market updates and some CSA events/activities, which you can access on our website page. An inexpensive cookbook that we have available, which we highly recommend is called FROM ASPARAGUS TO ZUCCHINI: A GUIDE TO COOKING FARM-FRESH SEASONAL PRODUCE by the Madison Area Community Supported Agriculture Coalition (“The A to Z cookbook”). It has an easy-to-follow format with produce listed from A to Z, background information, cooking and storage tips, and recipes. It is available from us for $16 (normally $19.95) at each distribution site throughout June or until they run out. It is a very handy resource and also makes a great gift! In past years we also have had a preserving book available for purchase, but are all out at the moment. If you let us know of your interest, we can order some more. It is called SAVING THE SEASONS: HOW TO CAN, FREEZE, OR DRY ALMOST ANYTHING by the Mennonite Publishing Network. This book was written by a mother-daughter farmer duo, and it includes beautiful photographs and easy to understand instructions for preserving fruits and vegetables. It will be available for $20. Please call ahead, if you want to u-pick on a day besides distribution days at the farm, so someone will be around to help you. A specified amount of u-pick strawberries, raspberries, and flowers will be part of your share at no extra cost. We may not be able to pick these items in large quantities for all CSA members, since they are labor-intensive and do not store well, so we may ask that you pick your own. If you want extra amounts of these items, just watch the newsletters for the cost and be aware of limited availability. We offer an “Extended Fall Share” for four extra weeks in October after our Summer Shares are over for around $140. The share size is usually bountiful in the fall, so there could be 10 to 16 items, which may include a variety of Cooking Greens (kale, tatsoi, spinach), Salad Greens (baby lettuce, arugula, mizuna), Brassicas (Brussels sprouts, cauliflower, broccoli, cabbage), Roots (potatoes, carrots, radishes, beets), Fruiting Veggies (winter squash, tomatoes, beans), and Alliums (garlic, onions). Our members will receive notice of this again in September. Non-members may contact us in September to check on availability. After the summer CSA season is over, we offer signup for a Thanksgiving share. This is a chance to stock up on vegetables before the holiday or for winter storage. You will receive a newsletter with storage tips, recipes, and 60 to 80 pounds of produce. The share may include: Brussels sprouts, rutabaga, cauliflower, broccoli, greens, squash, leeks, garlic, carrots, cabbage, potatoes, parsnips, onions, celeraic, or beets. A special addition to our share usually is a jar of locally-grown, lacto-fermented veggies (some from Tantré Farm) from a local business called “The Brinery” (www.thebrinery.com). The founder, David Klingenberger, started fermenting vegetables over 10 years ago at the turn of the century, while working at Tantre Farm. This share will be available for pick up on the Saturday before Thanksgiving, at the Ann Arbor Farmers’ Market or at Tantré Farm. A Thanksgiving Share may cost between $110and $120. Sign up will begin sometime in September and October, and will be mentioned in our newsletter. Non-members may contact us in September or October to check on availability. There are many “kid-friendly” activities on our farm. Children can play with the outside toys, swing, slide, and play in the sandbox or wading pools. They like to pet Kalli, our Australian shepherd dog, and our four cats. They feed the chickens, the ducks, the pigs, and the dairy cows/calves, especially apples and pears that fall off the trees in the backyard. Some children also like to take “edible farm walks” by following a farm worker around to various parts of the farm to sample produce, wild plants, or edible flowers. We also have a sunflower house and a kid garden that CSA member kids help plant throughout the first 2 to 3 weeks of our summer CSA season, and harvest throughout the season. These are scheduled workdays or open houses that are completely voluntary. The dates are listed on the Events calendar on the Events page of our website. Usually these include some optional farm work, snacks, refreshments, lively music from a local musician or band, tours of the farm, wagon rides, networking with other CSA members, and having fun. No one has to work though. This is completely optional. Family and friends are also welcome to come to just enjoy the farm. In addition, we would like to encourage some volunteer members to help with “Set up” and “Clean up” chores for work parties, especially if you are unable to make it during the 1 to 4 PM time, so less of the burden falls to our hard-working farm workers. The actual dates will be announced in the Aug. or Sept. newsletter. They also are listed on the Events calendar on the Events page of our website. Activities may include an edible farm walk, making butter and cheese, and learning about farm animals and vegetables through a variety of games, songs, & arts/crafts. There may be two or three of these scheduled throughout the summer, but always one is in August. Keep an eye on newsletters for more information. Space will be limited, so sign up early. We may have guided, monthly, exploratory walks around Tantre Farm. We’ll use all our senses as we take an approximately 30 minute hike and explore the farm’s fields, wetlands, and forest. These will be announced in our newsletters. Great tips for cutting, storing, and using the produce from that week’s share are offered in an interactive class for members. We often will end each session with a meal created by participants out of produce from the share box, which we consume with great pleasure. Please let us know if you’d like to help out with any other ideas or like to share your skills with others (soap making, salve making, medicinal and culinary herb talk, etc.). Also, let us know if you’d like to help coordinate activities, or know someone else who can lead an event. Watch newsletters and website for details. You may call Richard Andres or Deb Lentz at 734-475-4323. You can reach us by e-mail at tantrefarm@hotmail.com or info@tantrefarm.com. Our address is 2510 Hayes Road, Chelsea, MI 48118. Our website is www.tantrefarm.com, and certain website sections (such as “newsletters”, “upcoming events”, and “recipes”) will continue to be updated throughout the season. The above information is included on every newsletter.